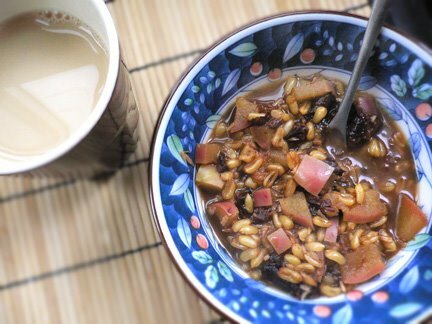 This breakfast is hearty enough for Vatas all year round, and for Pittas and Kaphas in winter and spring. It's bursting with flavour, energy, fiber and wholesomeness. This recipe takes a while to prepare, so it's good for a weekend morning or prepared the night before. Pictured above is the Kapha Kamut Breakfast with green tea chai. Soak the whole grains overnight in 1 cup water. In the morning, rinse the grains and add 1 cup fresh water. Bring to a boil and simmer for 1 hour or until kernels are swollen and chewy (half an hour for rice and barley). Add remaining ingredients and cook 10 minutes longer. If you're not using stevia, stir in a bit of honey after cereal has cooled slightly. In a small pot, bring 2 cups water to boil. Add remaining ingredients and low boil for 10 minutes. Using a small strainer, pour into 2 cups and sweeten with honey (Vatas and Kaphas) or maple syrup (Pittas). I've noticed a lot of your recipies include wheat for pittas, but I've been told by an ayervedic doctor that wheat increases pitta and to avoid it completely...? I was under the impression that fruits are generally recommended to not be mixed with anything - is this true in all cases? It's a matter of degree. At the most sattvic or "purest" level of food for nutrition, proper absorption, etc, fruits should only be eaten alone. But if your diet is moderate in following rules, my belief is that in combination with grains or dairy it's suitable. It's one of those instances where we need to find our own place in the spectrum of strictness, or do our best with eating fruits alone and minimize it in combination with other foods. I have read in several sources that Kaphas should avoid coconut, but shredded coconut is in the Kapha recipe?